During July to August of this year I got to be a feature poet at the Red Dirt Poetry Festival in Alice Springs. The event was conceived by Northern Territory writer, radio presenter and all-round great person Laurie May, who I was lucky enough to meet at the Woodford Folk Festival. I had a great first night listening to the Dirty Word open mic and watching the packed audience at the beautiful Totem Theatre. But my highlight was the Friday night Laneway Hip Hop, which featured NT’s Desert Sevenz and Darcy Davis. 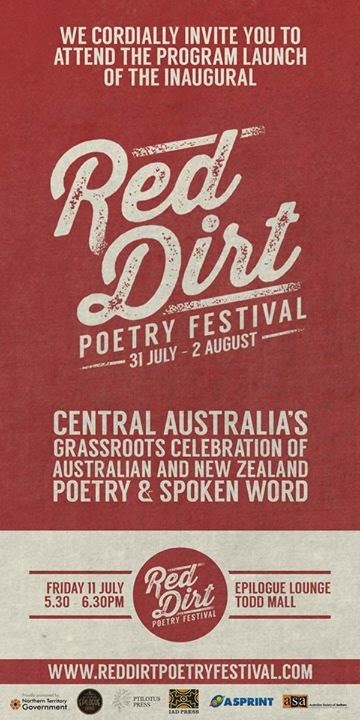 The Red Dirt Poetry Festival was a tremendous and diverse few days mixing poetry, hip hop and metal from Alice Springs with poets visiting from across Australia and New Zealand. The eclectic range of venues showcased some of Alice Spring’s hidden spaces for a first time visitor like me. I was a regular writing and drinking coffee at Page 27 Café throughout my time in Alice. The festival also made successful use of community space in the Alice Spring’s library where poetry and zine workshops were held. Planned for every two years the Red Dirt Poetry Festival will continue to showcase Alice and its diverse and talented arts community. The next event is planned for 2016.